A new member that has joined the operatic and popular trio, The Three Welsh Tenors has been described by his co-tenor as a "Sheep Farmer that Sings"
The singer Aled Wyn Davies, or locally named Aled Pentremawr, was last night exclusively unveiled on S4C's live programme "Heno" as the new Tenor that joins Rhys Meirion and Aled Hall in the Three Welsh Tenors. He takes the place of Alun Rhys-Jenkins, who has left the Tenors to concentrate more on his work in the opera world. "We performed together for the very first time last night, and I think he will fit in quite naturally," said Rhys Meirion, about the newest member. "But we will not be performing much around March and April, because he'll be too busy lambing. He's a farmer that sings rather than a singer that farms! "He's quite a character. A lad from the countryside - very similar to myself and Aled Hall - so were from the same nature." Aled Wyn Davies lives in Llanbrynmair, Powys and started his career as a folk-singer, but after winning all the important prizes in folk-singing at the Llangollen International Eisteddfod in 1999 and the National Eisteddfod of Wales in 2001, he started to broaden his horizons as a tenor soloist. One of Aled's greatest achievements so far is the fact that he has won the national tenor solo competition three times in succession in 2004, 2005 and 2006, then he won the ultimate accolade at the Swansea National Eisteddfod of Wales in 2006 - the famous Blue Riband vocal prize. Aled has had considerable success at all of our major eisteddfodau including "Singer of the Year" at the Llangollen International Eisteddfod in 2005, and the prestigious Blue Riband at the Cardigan Musical Festival in July 2006. "We hope to launch officially as the new Three Welsh Tenors in February, 2015, and were also hoping to release a single quite soon in the new year" said Rhys Meirion. There will be a concert to note the occasion on 8 March in Porthmadog. Other concerts are in the pipeline including an appearance at the Machynlleth Music festival in August, 2015. Well, that was a great weekend! Karina and myself has just returned from a lovely weekend to Southern Ireland with the company of the famous Morriston Orpheus Choir. We started on our trip on Friday morning from Llanbrynmair with Aria Wyn strapped up in the back. Aria was having a little break too, staying with Mamgu and tadcu in Aberaeron, and after unloading all of her toys and clothes etc and saying our goodbyes we carried on on our journey to Pembroke dock. At 1pm we met up with the choir for the first time, loaded our cases onto the bus, and we were away! About three months ago I received a call from Joy Amman Davies, musical director of Morriston Orpheus choir, and I was really delighted to be invited to sing with them in Kilkenny and Kinsale. I must say that this was the first time ever for me to even hear the choir live, and I was really impressed, not only by the contrast of rousing singing and the quiet sentimental feeling in their songs, but also the well organized planning and itinery that they gave. The four hour crossing to Rosslare was smooth and the time flew while we chatted away with choristers, Joy the MD, Jo the Accompanist and Les the organist, and we could see straight away that this choir like every other was full of interesting characters!!! The chats started with questions about my singing and farming, but soon moved on to rugby banter, especially as the Ospreys v Scarlets game was the following evening!! We arrived at our hotel in Kilkenny at 8:30pm, exactly as what was on the itinery. The Newpark hotel was a beautiful hotel, a twenty minute walk from the town centre, and the hospitality we received was second to none. We were treated to an evening meal every night, and I must say they were the best we've ever had on tour. We then retired to an early bed to recover from the journey without even a sip of Guinness. Something I cannot say for the rest of the weekend!! The first concert was at St John's church, Kilkenny, and after a good rehearsal with Jo Scullin, the choir's accompanist, and then with the choir we had a bit of time to look around the town. 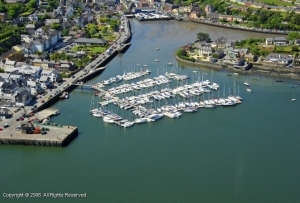 Killkenny has kept the traditional side of Ireland, with the old fashioned shops kept as original as they can, but they have also blended the modern side into the town with a new shopping centre that hasn't spoilled the area. The castle looked beautiful, with the River Nore flowing quietly beside. And the weather was great too. When I heard that we were going to Ireland in November I expected rain and more rain, but it was to the contrary. We were emblazed in glorious sunshine all through our weekend and didn't witness a drop of rain while we were there. The concert went great in Killkenny. The choir went down well and were well received as straight as they sung the Irish anthem. Their contrast of songs made the concert a real treat to the audience, and I really enjoyed their renditions of "Razzle dazzle" from Chicago, "To where we are" and the medley of popular Welsh hymns, from the church's sidelines. I enjoyed myself on stage too, and I sang Arafa Don, Musica Proibita, Shine through my dreams and Granada in the first half, followed by O na byddai'n Haf o hyd, My Little Welsh home, Because and O Sole Mio in the second half; but I must say that in both concerts the experience of singing Nicholas Brodszky's I'll Walk with God with the Morriston Orpheus choir was the highlight of the whole trip. Their quiet singing is delightful, but the way they open out at the end of songs are amazing and raises the hairs on the back of your neck, even when you sing with them. hours later, and we could see in an instant why it's such a popular location with visitors. The St Multose church looked down over the town towards the harbour, and I must say that this church has great acoustics, and one of the best places I've ever had to sing in. The concert went superbly that night, and the packed out audience was very appreciative, and the whole church and myself were completly relaxed after I told them that the last time I came to Ireland was to compete in a sheep-shearing competition about twelve years ago!! They didn't expect that! I changed a couple of songs that night, adding "Some enchanted evening" and the "Anthem" from Chess to my repertoire. The choir again were in fine voice, and the three standing ovations that we received at the end of the last few songs was something that will stay in my memory for a very long time. Our next appointment on our agenda was the afterglow at the Whitehouse tavern in town, and that's where the real characters of the choir came to light. The choir, and myself a few times sang into the early hours to the affection of the locals, and I'm sure that one of those Magners cider towers was nearly emptied by dawn!!! Our final day started by chatting with the residents of Kinsale on the streets, and I cannot count how many came to speak to us that morning saying how much they enjoyed the concert. We could really see that this town had a close-knitt community where everybody knew each other and somewhere that many would love to live in. We arrived in Cork at noon, and it was a good opportunity to do some souvenir shopping. Later we visited Waterford for an hour or so before catching the late ferry home to Wales that evening.Our smooth crossing back home mirrored the smoothness of how everything had gone through our visit to Ireland. Can I just take the opportunity to thank the Morriston Orpheus choir, and Joy for such a great weekend. We have made many new friends and Karina and myself were made to feel very welcome with everybody in the choir. I feel it a great honour to be involved in concerts with this choir, and hope that we will have many concerts together again in the future. A huge thank you also must go to the residents of Kilkenny and Kinsale for their lovely hospitality. Nothing was too much for them, and the hotels and food we recieved was second to none. The love of the Irish will stay in our hearts for a very long time. 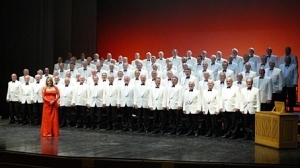 to sing in a grand concert at the North American Festival of Wales. Twelve months ago, Aled accepted an invitation from Ilid Anne Jones, Musical director of North Wales choir, Hogia'r Ddwylan to go with them as guest soloist to the United States. Aled was very privileged indeed to be invited and was very excited to go to Ohio. There is quite a lot of history between Ohio and Aled's village, Llanbrynmair in Mid Wales, because in the late 1700s and early 1800s many people from Llanbrynmair emigrated to Ohio to find a better life. Ezekiel Hughes (1766 - 1849) was a pioneer and the leader of the first group of settlers from Llanbryn-mair to the United States in 1795. It is believed that he and his cousin, Edward Bebb, were the first Welshmen to settle in Ohio. Indeed, one of the early Ohio settlers came from Aled's farm, Pentremawr. Aled will be looking forward to hearing more about the history of Llanbrynmair-Ohio at the festival. Aled and Hogia'r Ddwylan will perform at the Grand concert on the Saturday evening, and they will also take part in the afternoon and evening gymanfa ganu's on the following Sunday. Following four days in Ohio, they will then travel to Chicago, and a concert has been organized at St Jerome's parish church, Chicago on tuesday 6th of september at 7pm. I'm sure it'll be a great tour, and 50 members of the travelling party will start off this thursday early at Manchester airport. A report of the tour will be posted here soon. Click on the link below to enter the National Festival of Wales website where there is a full programme of the festival's events. Well, It's been a quiet period on the News updates over the last few months, but Aled's trip to Iceland will be posted soon. 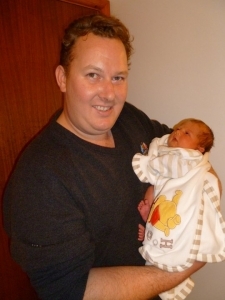 But a bit of very exciting news is that Aled and Karina are thrilled to announce the birth of a baby daughter who was born on the 27th of October, 2010, weighing in at 7lb, 11oz. Her name is "Aria Wyn". All is fine at the Davies household, and little Aria is not keeping her parents down too late with sleepless nights at the moment. There will be a report here soon on the trip to Iceland, a look forward to Aled's upcoming concerts before Christmas, and News of another concert tour to the USA in 2011. Please check to diary for more information. 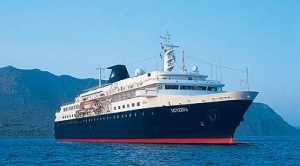 On July 28th, Aled will be returning to Dover to catch the Swan Hellenic Cruise ship Minerva, that will be his travelling home for the next two weeks. This years cruise will take Aled to the Scottish Islands of Orkney and the Shetlands, before taking a clockwise tour of Iceland, visiting many towns and cities including Reykjavic, before visiting the Faroe Islands, and finally Edinburgh on the way home. Aled will be singing in concerts on board Minerva, and this year he will be joined by Diana Palmerston, Soprano, Sian Meinir, Mezzo, and accompanist, Eirian Owen. Photos and news will be posted here soon after they return. Bon Voyage!! JANUARY 2010 : ALED SINGS FOR LOS ANGELES WELSH FOR THIRD TIME! 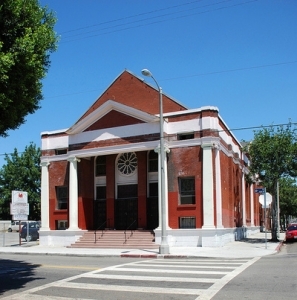 Aled will be returning to the USA to sing at the Welsh Presbyterian Church, Los Angeles next month for the third time following an invitation from the organizing party in California! Following the success of Aled's previous visits to LA in 2003 and 2004, Aled is really looking forward to performing for the Welsh with his new repertoire, and is very honoured to be invited back again. Aled and his wife, Karina will be flying out a few days before the concert, which is on the 28th of February, the day before St David's Day, and they will I'm sure have time out to visit the sights and tread the sparkling streets of Hollywood before returning home in time for the busy lambing season back on the farm in Mid Wales!!! A report of this exciting trip will be posted soon in March, including more news regarding another planned trip for Aled in August! !